The Education Ministry on Tuesday of December 16 took a critical step in its initiative to reform the college entrance exam system, aiming to reverse exam-oriented education to help fuel future growth. According to the ministry, university entrance will no longer be solely determined by students’ Gaokao score, the national college entrance exam. In addition to exam results, students will also be evaluated on their morality standards, physical health, art cultivation and social practice. For example, volunteer activities will result in merits. Previously, only a small fraction of students were awarded extra Gaokao credits, mainly for success in academic competitions such as the highly competitive mathematical Olympiad. The current trend is that most students undertake a fixed, universal diet of exam subjects in either the sciences or arts. In the future, students will be allowed to submit the scores of three subjects from a pool of six — biology, chemistry, geography, history, physics and politics — together with their mandatory Chinese, math and English scores. “The new regulation will help students take advantage of their strengths and overcome their shortcomings,” said Zhou Bin, a schoolmaster from Haining city in Zhejiang province, adding that often students paid too much attention to their weaknesses. 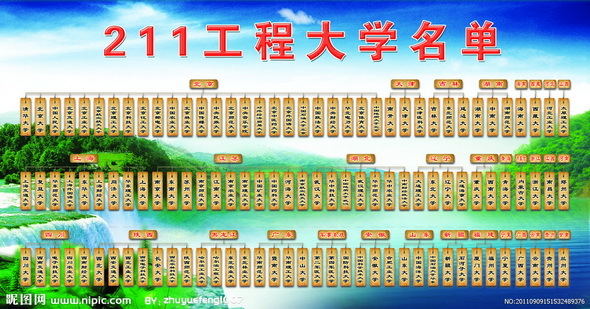 China resumed the Gaokao system in 1977. Since then, the exam has been called a “single-plank bridge” because of the wide gap between applicants and admissions. But in recent years, Gaokao has attracted criticism for its suffocation of students’ innovative spirit and its juxtaposition to modern society, leading to serious brain drain. The number of students taking the Gaokao test has declined from its peak of 10.5 million in 2008 to some 9.3 million this year, and many top scorers chose to study in Hong Kong. “We need to transform our education system to one for the people, to better cultivate our students,” said Zhou Bin. Chinese President Xi Jinping has called for more efforts in government work on overseas studies to cultivate talent in the drive to achieve national rejuvenation. Xi gave the written instruction to a conference on promoting work on Chinese students studying overseas and foreigners receiving education in China. The conference was held on December 12 and 13 in Beijing. Xi said he hoped Chinese overseas students could open their eyes to the world and study hard to contribute wisdom to the country. China has sent more than 3 million students to study abroad since 1978 when the country started reforms and opening-up. Destinations of their studies have been expanded from only a few countries such as the United States and Japan to more than 100 countries in 2013. About 360,000 international students from more than 200 countries and regions are studying in China. Premier Li Keqiang also encouraged promoting overseas education. Chinese overseas students should work hard to master advanced knowledge and technology. The government should also improve service to foreign students in China to enhance international friendship and exchange, Li said. He instructed the government to provide a sound environment for returned overseas students so they can become a new force in business and innovation. More than 80 percent of China’s academicians of Chinese Academy of Sciences and Chinese Academy of Engineering have studied overseas, said Cen Jianjun, who was in charge of international cooperation and exchanges under the Ministry of Education. More than 700 universities and colleges are receiving international students who are majoring in almost all the subjects, he said. China has also set up mechanisms for cultural and people-to-people exchanges with the United States, Russia, Britain, Europe and France, which have promoted China’s overseas education, he said. To those outside of China, the numbers “211” and “985” may hold little meaning, but inside the country they hold the power to determine the future career of millions of university graduates. For years, the country’s universities in the “211” and “985” projects, the country’s key institutions of higher learning, have had countless students vying for entries. Like it or not, in an increasingly competitive country, these simple numbers are the tickets to better jobs and higher paychecks for college graduates. Recruiters in China traditionally favor students with “211” and “985” backgrounds, often considered the ivory towers of education, believing these prestigious titles guarantee quality applicants, though candidates from less known universities could be equally excellent. As this year’s hiring season proceeds, company heads are scouring the country for graduates from these key institutions. Wei Ming, a college graduate, got up early to join a crowd of applicants attending a job recruitment session last week in Dafeng City, east China’s Jiangsu Province. During the event, recruiting heads from a state-owned high-tech company made it clear: talents from these revered colleges could get a monthly salary of at least 7,000 yuan (1,142 U.S. dollars), while the highest pay for non-key universities is at most 6,000 yuan, according to Wei. Even in the capital city of Beijing, the rules are similar. A recruiting head, who is on a hiring tour in Beijing, said on condition of anonymity that his company prefers students from key universities, which provide better talent sources. He said that students from less-stellar colleges may be outstanding, but the number of such students is dwarfed by that of key universities. “We don’t want to risk hiring people not so talented, because we need to think about the future of our company,” said the unnamed source. With frequent occurrence of similar sessions, the “elite titles” are increasingly under fire, with the public complaining about unfair competition in the job market and calling for “quality titles” to be abolished to ensure fairness. 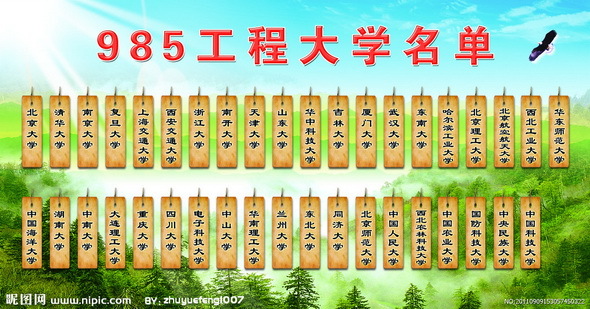 In a late November poll on microblog Sina Weibo, 23,143 participants, or 67.7 percent, voiced support for the abolishment of the education schemes. The Chinese government initiated the “211” and “985” projects to build world-class institutions of higher education in the 1990s. The “211” project aimed to raise education standards in about 100 colleges and universities in the 21st century (hence the number 211), and the “985” project, named after its launch date on May 1998, endeavored to select the cream of the crop from the 211 institutions. The hugely ambitious schemes have improved the education levels in many institutions, with colleges bettering standards in order to obtain the titles. It’s a situation which begs the question: are the projects necessarily the best measure to guarantee education quality these days? To many job seekers, without the halo of these numbers, doors to a number of great opportunities are firmly shut. Liu Qiang, currently a graduate student in the famous Jilin University in northeast China’s Jilin Province, went around the province to find an ideal job after graduating from a little-known university. He said he was left to eat the dust of his peers with these enviable backgrounds during his job hunt in Jilin. “The recruiting staff always turned me down, simply because I was not from a ‘211’ or ‘985’ university,” Liu told Xinhua. Recruiters’ obsession with the numbers has prompted a rush among many students to seek further study in these elite colleges, including Liu, who had managed to enter a university that falls under both titles. Liu hopes it will give him an advantage in seeking jobs. However, the future picture may not be so rosy. Zhang Zhongdong, a graduate from Tsinghua University, one of the country’s top two, went to multiple job interviews across the bustling capital, but was rejected by many companies because he did not study in project universities during his undergraduate study. “With such rules regarding our academic background, I can’t compete on a level field,” Zhang sighed. The “211” and “985” projects have also been accused of creating unequal distribution of education resources among Chinese universities, including central support and student enrollment. According to official statistics, Tsinghua University, which is under “211” and “985” titles, received 2.775 billion yuan in research funds from the government in 2013, accounting for 70.6 percent of its total. That number was 23 times higher than that of Southwest Petroleum University, which got a mere 120 million yuan from the central government. The latter boasted the biggest amount of research funds among all non-211 institutions last year. Different job prospects have also cast a negative impact on the enrollment rate of non-key universities, with many students choosing to apply for “211” and “985” colleges. It created enrollment difficulties for less-known ones, said Xiong Bingqi, deputy director of the 21st Century Education Research Institute in Beijing. The situation has had many colleges jump on the bandwagon of applying for these titles by speeding up infrastructure building, increasing academic subjects and intensifying efforts to get the best teachers from other colleges, whatever the financial cost. This has largely damaged the prospects of many less competitive colleges, according to Chu Zhaohui, research fellow with National Institute of Education Sciences. As urgency for change mounts, experts said reforms should be implemented with the so-called elite projects. But the complete abandonment of the schemes is unrealistic at the moment. Huang Wai, a professor with Sun Yat-sen University, said the key university projects played an important role in boosting education levels in China’s institutions of higher learning at a time when education resources were limited. But as times have changed, the administrative means of education resource allocation among Chinese colleges need reform. Xiong Bingqi said based on the current system, a special fund allocation commission needs to be established to give out financial support for colleges that are in dire need of money for development. “The commission should allocate resources based on the actual development levels and ramp up supervision. Only in this way can we truly guarantee fairness and further enhance education levels in the country,” Xiong said. 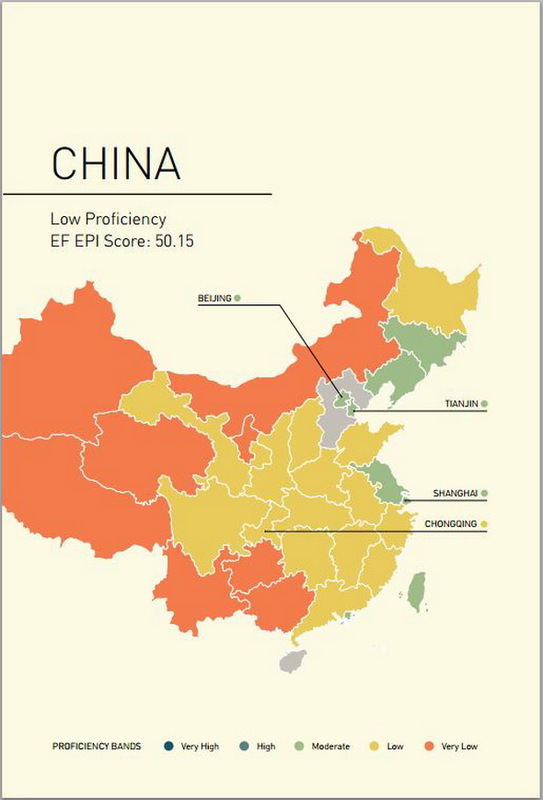 Three major cities in mainland China have outpaced Hong Kong for the first time in this year’s English proficiency index (EPI) published by English First (EF), a global language training company. Shanghai, Beijing and Tianjin saw scores of 53.75, 52.86 and 52.73, respectively in contrast to Hong Kong’s 52.50, whose ranking fell from 22nd last year to 31st this year among 63 non-english-speaking countries and regions in the index published last week. “These tests can help a student enter into a program within the EF framework. This is a measure of the general adult population and these are people who are interested in their language proficiency,” said McCormick. 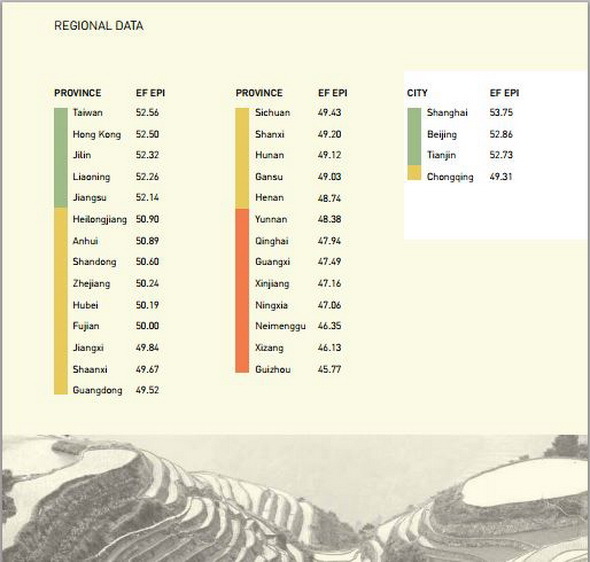 He said China has been a star performer in EF’s EPI ranking over the past seven years. Its results are getting better every year, especially the scores of Shanghai, Beijing and Tianjin. He says the Chinese workforce in these cities are becoming more international, Chinese firms are commonly heading abroad and more Chinese are travelling overseas. “Compared to Hong Kong, there is more acceleration in the general English proficiency of China’s mainland,” he said. He said in Hong Kong schools have three languages students focus on. With stronger emphasis on Mandarin and Cantonese there is less time for English in the curriculum. Wang Zimeng, an employer with a state-owned investment company in Tianjin said he was surprised to hear of EF’s results. He could not believe Tianjin surpassed Hong Kong’s EPI. “I had a period of work experience in Hong Kong, where I felt a great difference in English proficiency with Tianjin. In Hong Kong, English is used as true work language,” he said. Sophie Wang, a Chinese teacher working with the English Schools Foundation in Hong Kong, said Hong Kong has a natural English-speaking environment, with kids learning the language from kindergarten. “I don’t really feel mainland cities’ EPI has surpassed Hong Kong,” she said. However, McCormick pointed out that although HK IELTS’s academic results are better than that of mainland, the general scores are similar with Shanghai. The China education watchdog announced reforms to English-language testing methods, with the current system blamed for producing “dummy English learners,” who obtain high scores on language tests, but lack language communication skills. The education commission in Beijing further clarified last week that there would be no more unified English exams from primary to middle schools in the city, and there would be less focus on grammar in school English curriculum. “It is time to re-evaluate why you test. Teaching communication, leadership skills in English would be a useful way to look into the test, which would help people to communicate more internationally in workplace,” McCormick suggested. He said China’s mainland cities should pay more attention to communication, cultural and soft skills in the language rather than focus on test-oriented learning. It can help people grow more confident in using the language.